by work by world class design talent. with an Italian touch by chef Giovanni Gabana. Want to sleep and awaken surrounded by design? – ranging from 35 up to 140 square meter. Enjoy food and drinks with an Italian touch in the lively Bar/Restaurant Kazerne or book a table in the new fine dining restaurant with Nordic influences. Klein Paradijs, the complex of buildings where Kazerne is located, has a special history. Looking for an unique meeting- or modern event space? With a story and a mission? With a festive or business-like atmosphere? In the heart of Eindhoven, but away from the crowds? Kazerne offers several modern meeting and event rooms in an inspiring, atmospheric setting. Experience design 24/7. Sleep and wake up surrounded by the topical work of top designers. 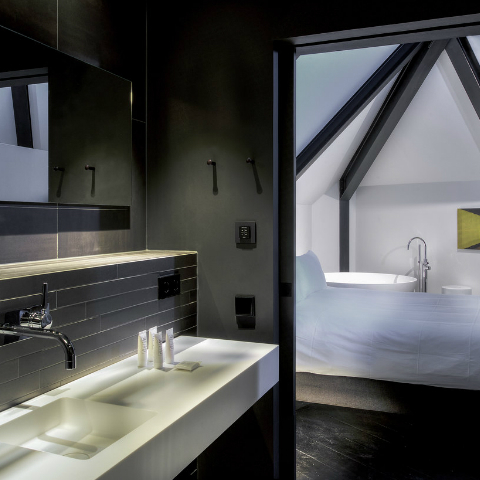 Discover Kazerne hotel, with 8 luxury rooms, suites and lofts with an artistic touch. Ranging from 35 up to even 140 square metres. Join the growing international community. Kazerne is the hot-spot where networks from the worlds of art, design, knowledge and technology meet.